CREIGHTON, JOHN, bookseller, publisher, municipal politician, and prison administrator; b. 19 Aug. 1817 near Clandeboye, County Down (Northern Ireland), son of Hugh Creighton and Mary Young; m. 8 Oct. 1850 Frances Coverdale, sister of Kingston carpenter and architect William Coverdale*, and they had eight children; d. 31 Jan. 1885 at Portsmouth (now part of Kingston), Ont. The eldest of four brothers, John Creighton came with his family to Kingston, Upper Canada, in 1823. He attended the Midland District Grammar School along with John A. Macdonald* who remained a life-long friend. After serving as an apprentice printer to John Lovell* in Montreal, he worked for the Kingston Chronicle & Gazette and rose to press foreman. In 1846 he transferred to the Kingston Argus as printer and manager and also contributed articles on mercantile affairs. He became an elder of St Andrew’s Presbyterian Church, served on church committees, and taught Sunday school. In 1844 he was elected president of the Kingston Typographical Society, an early trade union, and during his term sought to prevent the employment of apprentices in place of journeymen printers. Creighton moved to New York State in 1848 but returned to Kingston the following year, and in 1851 became a clerk in a book and stationery store which he soon purchased. By 1853 he had added a job printing department and bookbindery which were both managed by his brother, James Moore Creighton, until his death in 1865. Some publications were issued under his own imprint, “John Creighton,” others under his brother’s, “James M. Creighton.” Together they published many pamphlets, sermons and religious tracts, the Botanical Society of Canada Annals, at least three volumes of verse, including Charles Sangster*’s The St. Lawrence and the Saguenay, and other poems (1856), some prose fiction, and local history. 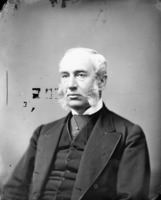 From 1859 to 1862, John Creighton served on the Kingston City Council as alderman for Victoria ward; in 1863 he was elected mayor, and was returned by acclamation in 1864 and 1865. As mayor he enlarged City Park, improved sanitary conditions in the town market place, and, after urging public support for poor relief, was voted $800 by council to disburse as he saw fit. When fire destroyed the market wing of the city hall in January 1865, Creighton received authorization to rebuild it and to procure a clock for the dome. Although Creighton was appointed police magistrate in 1866 and acting warden of the Kingston Penitentiary in October 1870, he continued in private business until the government of Sir John A. Macdonald named him warden in January 1871. He was the most respected warden in the history of the institution, and was also perhaps the most successful. He was an efficient administrator, and a humane and far-sighted leader in penal reform. His primary aim was not punishment but rehabilitation. He impressed upon his staff that even the worst offenders deserved compassion and four-fifths of them would respond to firm but kindly treatment. He considered lashings degrading to the prisoners and repugnant to his own feelings, though necessary as a last resort to restrain unruly convicts. On the few occasions when he did order the lash, he attended with the prison doctor and often remitted part of the punishment. Creighton believed that the first step towards moral reformation of the inmates was improvement of their physical condition. His changes included improved lighting, heating, and ventilation, better shoes, uniforms, and bedding, close inspection of all kitchen supplies, and a more varied diet. Exercise periods were doubled in length and extended to all prisoners. He ate his own meals in the prison dining hall, personally heard complaints, and visited the men in their cells, in the workshops, on the penitentiary farm, and in the stone quarries. He started a lending library, improved the school equipment, began night classes, and inaugurated prison entertainment by the inmates on holidays. In October 1873, after visiting six of the larger American penal institutions including Sing Sing Prison in New York State, Creighton noted with satisfaction that “in none of these Institutions are the convicts so well fed or clothed as with us.” Among the convicts at Kingston were Fenian prisoners arrested in 1866. One of them when released invited Creighton to his wedding; another testified that he “could not say anything but what was gentlemanly towards that noble Warden Creighton for I love and esteem him as if he were my own Father or Brother.” James George Moylan*, federal prisons inspector, had an equally high regard for Creighton’s achievements. In his report for 1881–82 to Sir Alexander Campbell*, the minister of justice, Moylan noted that the buildings and improvements carried out by convict labour during Creighton’s term of office amounted in value to $120,000, but cost less than $20,000, “tangible and convincing proof . . . of experience and good judgment in administering the Penitentiary.” In 1884 Moylan pointed out that although Creighton had served under seven ministers of justice, there had never been an inquiry into his administration. The prisoners’ high regard for him was reflected in their “admirable discipline” during an enforced absence when stricken with a heart attack “by too close attention to his work.” Despite a second attack in 1884 he continued working until a few days before his death. Correctional Staff College (Kingston, Ont. ), Canadian Penitentiary Service Museum, Warden John Creighton’s journal, 1870–74 (mfm. at QUA). PAC, RG 31, A1, 1861 census, Frontenac County. QUA, Corporation of the City of Kingston, Minutes of council, 1852–66; Reports of committees, 1852–66; A. E. Lavell papers, Unpub. hist. of Kingston penitentiary; Midland District School Soc., Board of Trustees, Minutes. St Andrew’s Church (Kingston), Marriage registers. Can., Parl., Sessional papers, 1871–84 (reports of the inspector of penitentiaries of the Dominion of Canada). Chronicle and News, 6 Oct. 1865. Daily British Whig, 31 Jan. 1885. Daily News (Kingston), 3 Jan. 1871, 31 Jan. 1885. Globe, 2 Feb. 1885. Weekly British Whig, 5 Feb. 1885. J. A. Edmison, “The history of Kingston Penitentiary,” Historic Kingston, no.3 (1954): 26–35. H. Pearson Gundy, “CREIGHTON, JOHN (1817-85),” in Dictionary of Canadian Biography, vol. 11, University of Toronto/Université Laval, 2003–, accessed April 19, 2019, http://www.biographi.ca/en/bio/creighton_john_1817_85_11E.html.